I’ve just bought a copy of [sublime text][st], a very pretty text editor for Windows. I’m a bit of text editor geek, but I think it’s justified, with the amount of time I spend typing. Between coding and writing fiction, I spend hours and hours a day typing, so a good text editor is as important as a comfy chair, a good monitor, or a cup of tea. It’s just not civilised without. If you spend much time writing text, you may want to have a look. I’m using mine for both programming code, and for fiction. 1. **It’s gorgeous. ** _Text Editing shouldn’t feel this good_, says the website, and it’s absolutely right. The colour schemes are lovely, especially _Chocolate Box_, which is shown on the screenshot. If simple text editors like [Notepad] feel like using a bic biro, and [emacs] and [vi] feel like using a technical pencil, [sublime text][st] feels like using a fountain pen. 3. **The support is amazing. ** It’s written by Jon Skinner, an Australian who left his job at [Google][gg] to write the editor. I wrote him an email yesterday suggesting a feature. Twelve hours later, he’s written the code and put it into the next beta. Twelve hours. And the reply email was chock-full of details he didn’t need to include, and an apology about the tardyness of the reply. 4. **Full-screen mode;** It has a full-screen mode that lets you blow the window up to occupy every available pixel, which makes it great for writing without distraction. 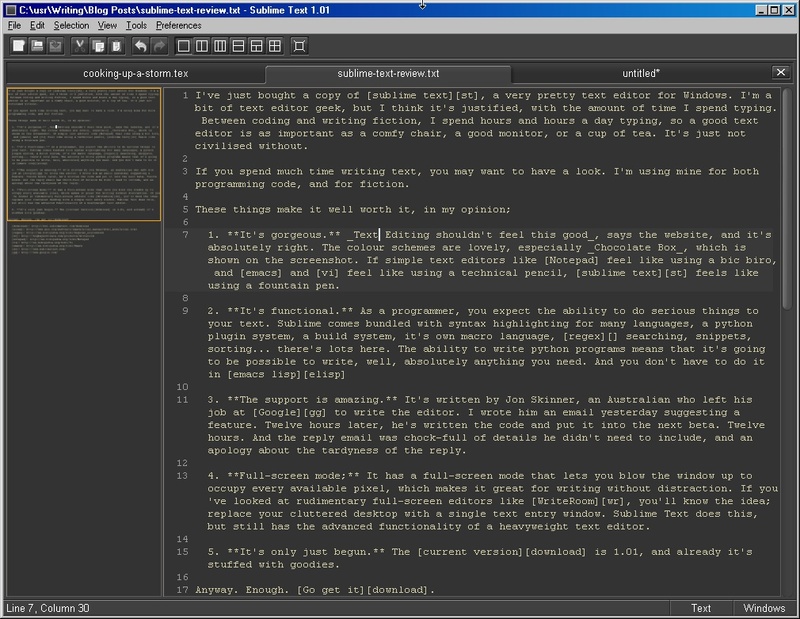 If you’ve looked at rudimentary full-screen editors like [WriteRoom][wr], you’ll know the idea; replace your cluttered desktop with a single text entry window. Sublime Text does this, but still has the advanced functionality of a heavyweight text editor. 5. **It’s only just begun. ** The [current version][download] is 1.01, and already it’s stuffed with goodies. Anyway. Enough. [Go get it][download]. Update: Here’s a copy of my enhanced Markdown package, which I use to write prose: [Download link](http://www.stevecooper.org/documents/Markdown-Enhanced.zip) — unzip it to your Packages folder. In the file `Markdown – Enhanced.sublime-options`, the first line describes the extensions which will open and use this format. Change it to change the file types (.txt, .fiction, etc) which will use this package. Sounds pretty good. I’m currently using E, a textmate clone. Something I start to hate about it is its Cygwin dependency. Anything E can do that Sublime can’t? Hi. Sublime also has a lot of textmate features — it reuses the same language files and colour schemes. I’ve not had much experience of E, although I did see the website and watched the short demo video, and Sublime can do everything E did in the site. For me, one of the main strengths is the developer, Jon. He’s very quick at turning around feature requests, often within a day or two for small tweaks. There’s a nice (new) system for writing plugins, so it’s turning out to be very flexible. Plus, there’s no cygwin dependency. $60? I look forward to liberating these ideas and making them free in an open source editor. You should not charge for things, I like things to be free for me. Of course you want things to be free. But why should anyone give you their hard work for free? I love the trial, and have been looking for a good text editor for a while, but the $60 pricetag is a bit prohibitive for me. More than UltraEdit, and nearly twice as much as E. Definitely have my eye on it. I love the minimap. I’m intrigued – I have ‘e’ at work, as I use TextMate at home, and there’s obviously an advantage in learning one set of behaviours / short-cuts. From the screenshots, this looks far nicer (less of a clone, but more something inspired by the same principles) but for me there’s a concern about different behaviour/short-cuts (the cognitive difference between things that look nearly the same, but are not). As for whether $60 is pricey – I recall people balking at the price of TextMate too. But surely the key question is how many hours of productivity does that represent?? As for Jon M – the question that needs to be asked is why hasn’t the open source community produced an editor like this, or TextMate – consider that these commercial editors have emerged AFTER the existence of vim and emacs. (I think part of the answer is that both TextMate and Sublime are the products of single developers, with a specific vision, while the nature of open source is that it suffers the same thing as Microsoft’s software – design by committee). I like so much that IDE, the only thing that netbeans for PHP had and this don’t that i use, is the Project Manager view. I know this is an old post, but I wonder if your enhanced Markdown package for Sublime is still available to download? I tried the above link, but it’s dead. I’ve just started a trial of Sublime, mainly because of its Markdown support.